« Save $100 on the CalDigit RAID Card or HDElement during March & April! CUPERTINO, California—March 3, 2009—Apple® today introduced the new Mac® Pro using Intel “Nehalem” Xeon processors and a next-generation system architecture to deliver up to twice the performance of the previous generation system. * The new Mac Pro starts at $2,499 and features the latest graphics technology and an updated interior that makes expansion even easier than before. 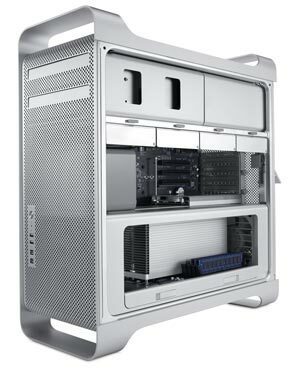 An updated interior provides easy access to all components within the Mac Pro for hassle free expansion. The Mac Pro includes four direct-attach cable-free hard drive carriers for installing up to 4TB of internal storage when using 1TB 7200-rpm Serial ATA drives. An optional cable-free Mac Pro RAID card delivers performance up to 550MB/s**** and allows the four internal drive bays to be set up in RAID 0, 1, 5, or 0+1 configurations for improved disk performance and redundant data protection. Every Mac includes Leopard®, the world’s most advanced operating system which features Time Machine™, an effortless way to automatically back up everything on a Mac; a redesigned Finder™ that lets users quickly browse and share files between multiple Macs; Quick Look, the best way to instantly see files without opening an application; Spaces®, an intuitive feature used to create groups of applications and instantly switch between them; Mail with easy setup and elegant, personalized stationery; and iChat®, the most advanced video chat. Every Mac comes with Apple’s innovative iLife® ’09 suite of applications for managing photos, making movies and creating and learning to play music. iLife ’09 features iPhoto®, which introduces Faces and Places as breakthrough new ways to easily organize and manage your photos; iMovie® with powerful easy-to-use new features such as Precision Editor, video stabilization and advanced drag and drop; and GarageBand® which introduces a whole new way to help you learn to play piano and guitar. Optional Apple professional applications include Aperture™, Final Cut® Express, Final Cut Studio®, Logic® Express, Logic Studio® and Shake®. The new Mac Pro will be available next week through the Apple Store® (www.apple.com), Apple’s retail stores and Apple Authorized Resellers. ships with Apple Keyboard with numerical keypad and Mighty Mouse. Build to order options and accessories include: one 2.93 GHz Quad-Core Intel Xeon processor for the quad-core Mac Pro; two 2.66 GHz or two 2.93 GHz Quad-Core Intel Xeon processors for the 8-core Mac Pro; up to 8GB for the quad-core Mac Pro and up to 32GB for the 8-core Mac Pro of 1066 MHz DDR3 ECC SDRAM memory; up to four 1TB Serial ATA hard drives running at 7200 rpm; Mac Pro RAID card; up to two 18x SuperDrives with double-layer support; ATI Radeon HD 4870 graphics with 512MB of GDDR5 memory; AirPort Extreme® 802.11n; Apple Keyboard, Apple Wireless Keyboard; Apple Wireless Mighty Mouse; Mac OS® X Server Leopard. Complete build-to-order options and pricing are available at www.apple.com/macpro. *Testing conducted by Apple in February 2009 using preproduction Mac Pro 8-core 2.93 GHz systems and previous generation Mac Pro 8-core 3.2 GHz systems. Based on estimate SPECfp_rate_base2006 results, SPEC is a registered trademark of the Standard Performance Evaluation Corporation (SPEC); see www.spec.org for more information. 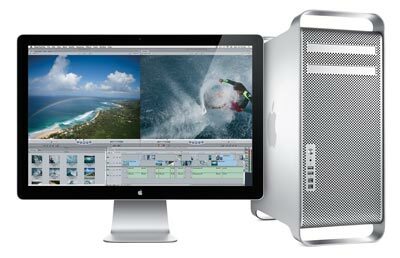 **Testing conducted by Apple in February 2009 using preproduction Mac Pro 8-core 2.93 GHz systems with 6GB of RAM and shipping previous generation Mac Pro 8-core 3.2 GHz systems with 8GB of RAM. Results are based on the STREAM v. 5.8 benchmark (www.cs.virginia.edu/stream/ref.html) using OMP support for multiprocessor-compiled builds. Memory latency data provided by Intel. ***Testing conducted by Apple in February 2009 using preproduction Mac Pro 8-core 2.93 GHz systems with 6GB of RAM and NVIDIA GeForce GT 120, and shipping previous generation Mac Pro 8-core 3.2 GHz systems with 8GB of RAM and ATI Radeon HD 2600 XT. Results based on Call of Duty 4 v1.7.1, Timedemoambush, Timedemobog, Timedemopipeline, maximum graphics quality, 4x antialiasing, at 1680 x 1050. ****Testing by Apple in February 2009 using preproduction Mac Pro 8-core 2.93 GHz configured with Mac Pro RAID card. Testing conducted using Iometer 2006.07.27 with a 30-sec ramp-up, five-min run, 512KB request size, and four outstanding IOs. System configured with the OS and test volume on a single four-drive SAS RAID 0 volume. Performance tests are conducted using specific computer systems and reflect the approximate performance of Mac Pro RAID Card. *****EPEAT is an independent organization that helps customers compare the environmental performance of notebooks and desktops. Products meeting all of the 23 required criteria and at least 75 percent of the optional criteria are recognized as EPEAT Gold products. The EPEAT program was conceived by the US EPA and is based on IEEE 1680 standard for Environmental Assessment of Personal Computer Products. For more information visit www.epeat.net. Systems configured with multiple graphics cards, a Mac Pro RAID card, or a Fibre Channel card do not meet Energy Star or EPEAT Gold requirements.